You may have already seen this, as it was published a few days ago (which on the interwebs is like being over 30), but it is so true that I had to share. And add XKCD to your feed reader. I had family visiting me for the July 4th weekend, and something they did that I never do was buy a Sunday paper. I read the local weekly papers, but never buy a big Sunday paper. The travesty of this is that I don't get to read the Sunday comics - so of course that was the first section I grabbed when I saw the paper sitting on the breakfast table. 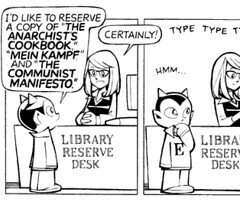 I only bring this up because a comic strip I've never seen before was very relevant to library work. Check it out, because it's funny, and true.